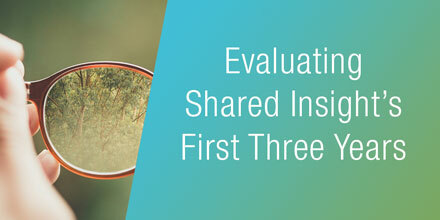 “Evaluating the Accomplishments & Lessons Learned from the First Three Years,” the latest in a series of reports from ORS Impact, Fund for Shared Insight’s evaluation and learning partner, reviews the collaborative’s progress and highlights challenges and opportunities to come. The report takes an unvarnished look at Shared Insight’s efforts to improve philanthropy by funding and supporting feedback practice, feedback research, and foundation listening and sharing. It examines Shared Insight’s work from its start in 2014 through last year. Shared Insight has made a unique contribution to a nascent feedback field in the nonprofit sector, rapidly and cost-effectively building momentum and know-how around high-quality feedback loops. Increasing evidence reveals that feedback practice can be transformative, with the potential to upend traditional power dynamics and become a tool to advance inclusion and equity. Challenges in the field remain, including how to promote a stronger vision of practice change among foundations. Overall, the report finds that Shared Insight’s original investments have yielded positive outcomes and progress. And it concludes that with an expanded base of funders, an updated theory of change, and lessons gained in the first three-year phase, the collaborative has the potential to yield even greater results going forward. Read the full report to learn more about Shared Insight’s work, accomplishments, and challenges.